Adaptive Sports Riding offers skill-based lessons for children and adults with disabilities. We focus on skill development and progression while improving the rider’s physical, cognitive, emotional and/or social skills. Taught by a certified therapeutic riding instructor, and assisted by volunteer aides, the group, semi-private and private lessons are 45 to 60 minutes. Riders who have physical, intellectual, cognitive, developmental and learning differences can benefit from therapeutic riding. Vaulting is an activity where participants perform movements on a horse or a barrel. This could be a simple movement, like standing on a barrel, or something more advanced, like kneeling on the back of a horse. EAA incorporates equine activities and/or the equine environment. Instructors use the movement of the horse to address individuals challenges, such as deficits in balance, strength, endurance, coordination, communication and attention. In this program for veterans, participants learn riding skills and basic horsemanship, while building meaningful relationships with their horse, all of which transfers into improving the riders' daily lives. These skills help veterans reintegrate into the community. Benefits: improves balances, motor skills, muscle tone, core strength, and endurance; develops confidence, trust, communication skills, while alleviating anxiety and anger. 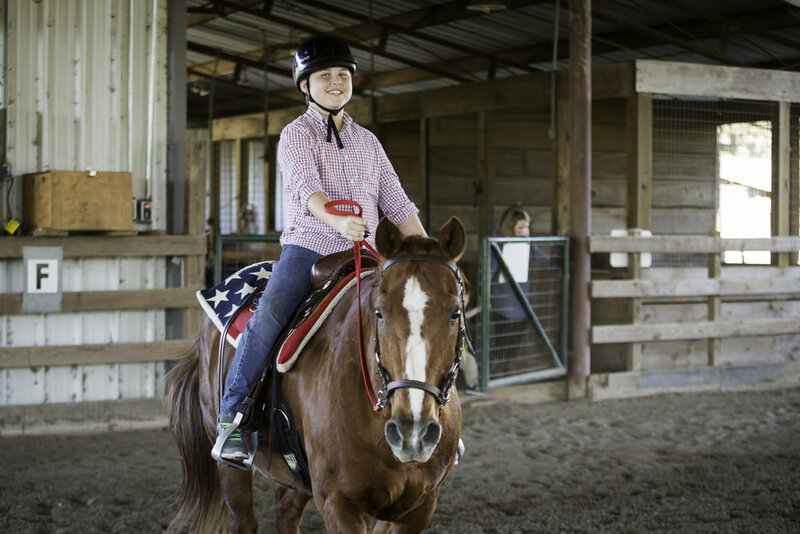 The horsemanship program is designed for children without disabilities who are interested in learning how to ride and care for horses. Horsemanship classes are designed to show the rider's ability to ride and handle his/her horse. However, horsemanship is more than just a horse show class. It is a basic skill that every good horseman should know, and good horsemanship is an asset to the rider and horse in any riding discipline. Horsemanship focuses on the rider's ability to seamlessly communicate with the horse on the ground and in the saddle. Additionally, rider’s appearance and position in the saddle, and his ability to control his horse, as indicated by the horse's performance in the maneuvers prescribed. The horse should move naturally, quietly and smoothly throughout his or her performance. The horse and rider should give the appearance of confidence and ease of movement. The end result of these horsemanship classes is a well-educated horse and rider that not only perform particularly well, but also share a connection with each other beyond simple skills. Riders should be 8 years and older to participate in Horsemanship classes. Please complete the Horsemanship Registration form and submit to emily.davis@gaitway.org to apply. GaitWay is a member center with the Professional Association of Therapeutic Horsemanship International (PATH Intl.). PATH Intl. provides guidelines for precautions for participants with certain limitations as well as conditions that are contraindicated for mounted equine-assisted activities. GaitWay staff members are certified and trained to educate individuals interested in becoming certified instructors or therapists providing hippotherapy. Internships are available in many areas of nonprofit management as well as therapeutic riding and hippotherapy.